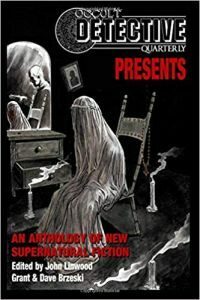 You are here: Home » GENRE » Cri-Fi » Occult Detective Quarterly Presents edited by John Linwood Grant & Dave Brzeski (book review). Occult Detective Quarterly Presents edited by John Linwood Grant & Dave Brzeski (book review). Writing even a contemporary detective story at short length is difficult. It is not the setting of the scene that causes the problem but being able to show how the mind of the detective or, in some cases, the villain works. If there is insufficient space the detective has to either be regarded as an intuitive and observant genius, like Sherlock Holmes, or that the author hasn’t worked out all the logical stages and merely leapt to the conclusion. Thus, the more space there is to develop the characters, setting and deductions, the better and more satisfying the story will be to the reader. That gives the longer stories, as in this volume, the opportunity to make more impact. Detective fiction has been around for a long time and supernatural stories for even longer. In long evenings, before the advent of books or TV, entertainment provided by the bard relating tales of gods and ghosts was popular. Nothing has changed except perhaps to combine detective and occult fiction and as can be seen from these stories there is a great scope for inventiveness. The settings are various, too, from historical to contemporary along with the degree of influence the ‘detective’ has. At some point, though, in each genre, someone sorts through the information gleaned to come up with an explanation, logical or not. In the late Victorian period, belief in ghosts and spirits spawned mediums, most of whom were frauds preying on the gullible and a plethora of authors of ghost stories. It comes as no surprise that contemporary writers find the era a fertile place to set stories and this volume begins with one such. ‘Her Silks And Fine Array’ by Amanda De Wees is set in a haunted house with a particular room mostly susceptible to the disturbances. As a last resort, a medium is invited to try to resolve the situation. Because it is a short story, there are still glitches and the characters jump to conclusions that would have been explored more logically with more length. ‘Mrs. Lillicrop Investigates’ by Bev Allen has the same Victorian feel but is set in the 1920s/30s. The title character is another medium who is called in to investigate mysterious happenings. Though the cause of the problem, a ring, is a fairly obvious device, the effects it has are not. Mrs. Lillicrop is the kind of character that instigates the solution rather than leads the charge, who quietly does what has to be done. She is also the kind of character you expect to turn up in other stories. Occult events are not all hauntings and can occur at any time in history. ‘Lazarus Come Forth’ by Robert Pohle is set in Palestine at the time when Yeshua was an itinerant preacher. Grief can cause people to do things that normally they’d consider stupid, so when her brother dies, Martha takes an ancient scroll to the local rabbi and pleads with him to use it to resurrect her brother. As in W.W. Jacobs story, ‘The Monkey’s Paw’, Martha finds out that what you wish for is not necessarily what you get and meddling with the occult can be dangerous. While this can’t really be classed as a detective story, it very effective. One of the problems of writing a good story in the digital age is keeping up with the advance of technology. In William Meikle’s ‘Farside’, this as apparent. Except for the occasional mobile phone, it could have been set in any decade of the 20th century and not suffered. The detective, in a first person narrative, is hired to tackle a stalker who is harassing his victim by appearing in mirrors and anything with a reflective surface. The length of the story allows the author to develop the characters so that they become more than ciphers. ‘A Shadow Against The Stars’ by Charles R Rutledge is very much a contemporary story. Here the main detective, Jen Grail, is a cop attempting to solve murders and coming up against an invocation of harpies. Summoned by an amateur for revenge, they have not been dismissed after the job was done and are causing havoc. She enlists the help of Kharrn, a monster hunter. Again, there is an impression that this is one of a series. This is also true about John Conquer, the protagonist in Edward M Ederlac’s ‘Conquer Comes Correct’ although here there is a précis of the characters experience that has lead him to the point in time of the story. The problem he has to solve is why gang leaders are dying and a skinned gorilla has been found in the street. It is a gritty, contemporary story. Also contemporary but more ‘middle-class’ is ‘Ritual Killings’ by SL Edwards. The detective called in to help solve the apparently ritualised murders. The denouement almost seems too easy especially as Joe Bartred takes his teenage daughter on the case. Anyone who knows and enjoys Adrian Cole’s ‘Nick Nightmare’ stories will be delighted with ‘At Midnight All The Agents’. The final and longest story at 100 pages in this volume features Nick Nightmare and his friends. It starts with a mystery in the crypt of a church and an enemy determined that Nick will fail in trying to reform the group known as Vengeance Unlimited. Set in a world suited to the pages of a graphic novel, it is fast-paced and, in places, surreal. Above all, it is an enjoyable romp. The whole book is rounded off with a reprinted essay from Mike Ashley ‘Fighters of Fear’ which charts the history of the occult detective. « Gemini Gambit by D Scott Johnson (ebook review).